The piggyBac™ transposase technology is a non-viral, gene delivery system designed for use in many different research applications. 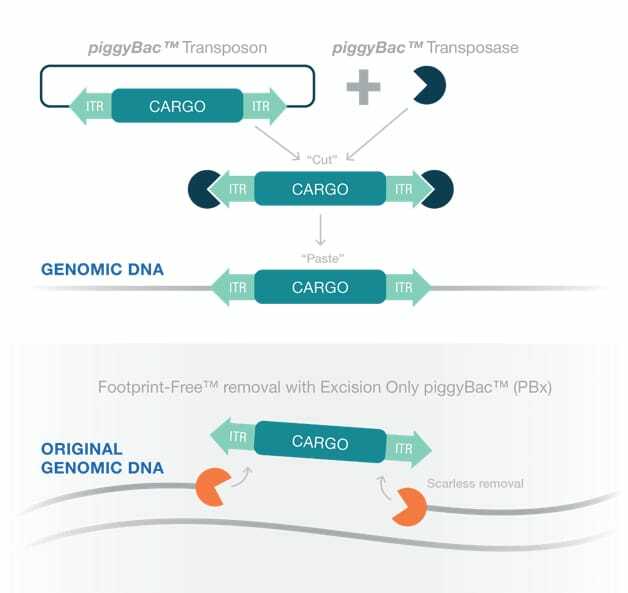 With a large cargo capacity of over 200kb, piggyBac™ surpasses many other transposon and viral delivery vehicles, making it the optimal choice for stable cell line creation. The high efficiency and stability of piggyBac™ integration events have proven effective in a variety of genomes. To date, over 550 peer-reviewed papers have been published as a result of the piggyBac™ technology. Hera can use the piggyBac™ technology to create stable tumor cell lines for imaging with Luciferase or other reporters (i.e. TK for PET imaging). PiggyBac generated luciferase reporter cells lines show enhanced stability. Creation of BAC transgenic SRIPA rats with piggyBac compared to CRISPR/TALEN nucleases. PiggyBac Reporter Hep-G2 cell line for high throughput and high sensitivity screening of AhR transcription and study of cytotoxic compounds.